Colour is an important constituent of food. When we think of an apple, our mind shows a nice picture of a red apple, grapes are associated with blue or green colour. Addition of colour to food gives an attractive and appetizing appearance and also enhances its acceptability. Ancient people used natural ingredients like saffron and ‘haldi' or turmeric to give a rich orange or yellow color to various foods. Other natural foods such as carrots, grapes, spinach, tomatoes were also used as coloring agents. With the advent of food technology we now have a wide range of artificial food colours as additives. A food colour is a substance that is added to food or drink to change its colour. You can make a palak paneer look greener or a Manchurian look bright red. Food coloring is used both in commercial food production and sometimes even in home cooking. So what are the advantages and the disadvantages of these? This is something that you probably have not given a thought to. The main and only advantage of the food colour is to make the food look more appetizing. When natural colours like turmeric are used, they are some health benefits too. The disadvantages of using artificial food colouring seem to outweigh the advantages. The disadvantages may vary from the colours causing simple allergies to some heavy metallic colours that can be carcinogenic or cancer-causing. And more often than not even the safe food colours are used in excessive amounts to give the food a nice colour, which may be harmful. 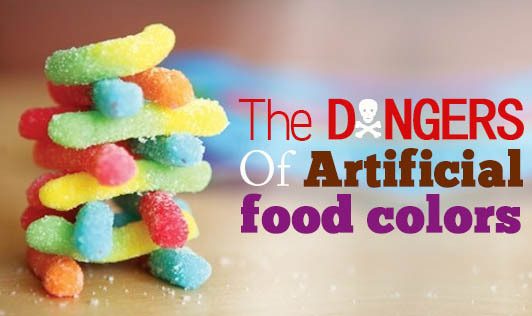 Some of the artificial colours can even destroy the nutrients in the food because of their chemical composition. Synthetic Food Colours, also known as Artificial Food Colours, are manufactured chemically and are the most commonly used dyes in the food, pharmaceutical and cosmetic industries. Some of the chemicals used may not be under permissible values and hence make the whole food colour unsafe. Go Natural!!! Natural colourants are extracted from natural herbs and plant parts. For example kokam, beetroot and safflower form a very large source of natural coloring agents. Usage of food colours is not bad, but the right use of the right colour is most important. Use natural colours found in foods like greens, bright red tomatoes, white radish, and turmeric. "Blue colour is believed to be an appetite suppressant. Your foods might not look appetizing when you eat from a blue plate. In the hospitality industry, blue plates are not normally used in food service"